I took a blogging break for awhile, but here I am, back at it! Turns out the break was healthy for me cause apparently I needed to proactively do non-infertility activities for awhile to get my mind back on focus. I got so overwhelmed and inundated and absorbed with all things IF that I literally thought about it day and night and it wasn’t doing me any favors. It’ll be back on me soon enough with beginning IVF in a few weeks, but maybe now I can ease back into things. I had my hysteroscopy and mock transfer on Friday. It was a mercifully short procedure–go in with full bladder, insert catheter, look around. Stop to pee. Re-insert catheter, look around some more, get dressed, go home. The wet feeling of the dripping saline was probably the grossest part of the whole thing. 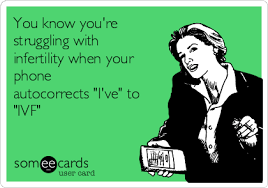 I had immediate cramping during the hystero and spotted and cramped for a few days after. It was uncomfortable but nothing that couldn’t be tamed with ibuprofen and a heating pad.The doctor who performed it (Dr. C’s associate) was very kind. She told me that even though my uterus is turned left about 30 degrees (which I already knew) and even though it’s significantly rotated to the left (which I didn’t already know) from scar tissue, none of it should be problem enough to not go ahead with IVF. That was a huge relief! Next step is a 2-hour nurse consult for DH and I this Friday. After that, we get all our affairs in order with the clinic and basically wait for my next period which should be sometime around August 4. I missed u! Glad u enjoyed your needed break though. Also happy to hear your H/S went well! I’m just now seeing this. Glad your hysteroscopy and mock transfer went well. Did Dr. G. do your procedure? I love her. My new clinic doesn’t do mock transfers and I am like, “Hmmmmm, what kind of shady business are you running here?” Haha. Luckily, I’m told that I have a straightforward uterus, so I’m going to roll with the no mock-tranfer thing, but it does make me a little nervous. That’s so exciting that you’re starting IVF so soon. August 4th is like wayyyy soon! WOO! Next Next post: Am I Seriously Doing This? !